Heather Huffman of Fife Lake carries her children's sleds following Saturday's Carly's Hill 6th annual Cardboard Classic Snow Fun Day at the Springfield Recreation Area near Fife Lake. 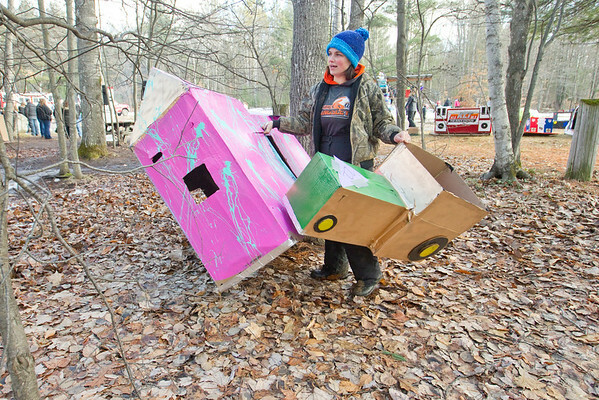 Awards were handed out for the best cardboard sleds, but lack of snow forced the cancellation of the distance run, which has been rescheduled for Saturday, Feb 10 at 1 p.m. "It feels weird not doing it," said organizer Tammie Budrow. "We're calling it the Carly's Hill mud fun day."